The construction of a tourism route between Magurata and the Belogradchik rock has started last summer. 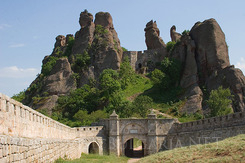 The route with a total length of 13 km will start from Bela village and will reach Belogradchik. According to the regional governor of Vidin this will be the main tourism route for visits to Magurata cave, the Rabisha lake and the Belogradchik rocks. At the moment the regional administration is working over the idea for a united tourism product in Vidin region.